I know most mom's out there LOVE to cook, well I DO NOT!" I actually HATE IT! I would rather do laundry the old fashion way with a little bucket and a scrubby tray thing, than make dinner. If any of you reading want to take me up on it, I will gladly trade you laundry duty for some cassaroles. Are any of you familar with this look? Probably not, because I know no one else can cook as bad as me. I made steak this night and Nathan has the smallest piece on his plate along with 2 little green beans and some white rice. 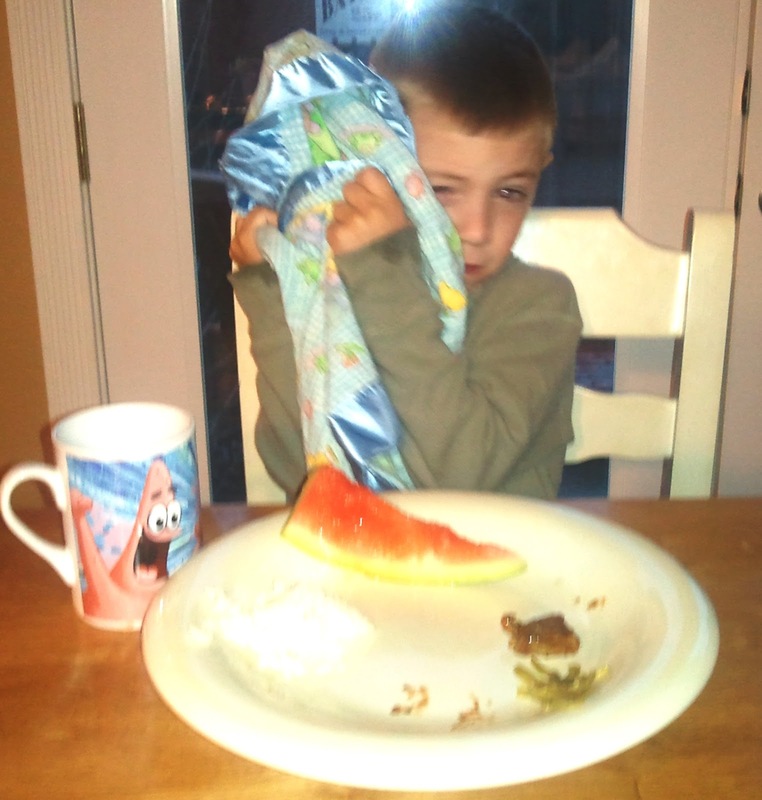 You might notice the half eaten watermelon which is the only thing he actually ate that night. So sad, I was NEVER EVER allowed to not eat my vegtables or allowed to even "think" that I could not eat my vegatables. I don't know how you force someone to eat something, I certainly am very weak at this type of dicipline and I know I have two boys just laughing at me while they sit back and not eat what I gave them for dinner. Did I say I hate dinner? Now I am going to go and paint something out in the finish shop, at least the cabinets can't say no to me and I don't have to fix them dinner! 1) puree all veges and mix into either jar of spaghetti sauce or mac'n cheese when making the "cheese"
3) do you fold it too?? I will trade laundry for dinners anyday!